I never thought I would be one of those people who got their groceries delivered. And I’m still not because I live in the middle of nowhere and I can’t get delivery out here. But what I can do is set up a pickup time. At Walmart. WALMART, y’all. The first reason I gave the hairy eyeball to this idea is because I thought nobody could pick out cans of green beans like I could. So, I never gave it much thought. But then, I started noticing how many things jump in my cart that is not on my list. The second observation in my grocery buying was how much time I spend going to 2-3 stores each weekend. I would buy my paper products and cleaning supplies from Dollar General. We have a new clean one in my tiny town and it’s so convenient. I buy my produce from Publix. Wide selection, very clean and well-stocked. I love strolling the Publix produce aisle for ideas with fresh produce. My third store was mostly Target for boxes, packages, and dairy. It used to be Walmart right by my school but it is usually not well-stocked. Saturdays should be full of everything but I would walk out with a lot of stuff I didn’t need and missing a few things I REALLY needed. Then, they went and put a Neighborhood Market close to my school. I LOVED the Walmart Neighborhood Market. It’s a giant grocery store but not as big as a Super Walmart. I decided to try this pick up thing. I downloaded the app. 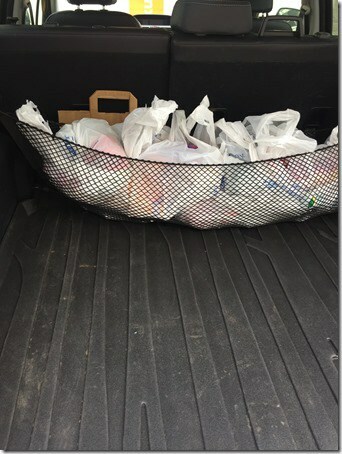 Then I made my list at home and used my laptop to fill my cart with ONLY the things I needed for meals the next week. I could immediately check my pantry and fridge for duplicates. My bill was about $50.00 less than normal. That’s a big difference! After I ordered and paid, I got my email confirmation and a prompt to use the app to “check in” when I was on the way to the store. When I pulled up to the parking area, I was prompted on the app to pick which parking spot I was in. 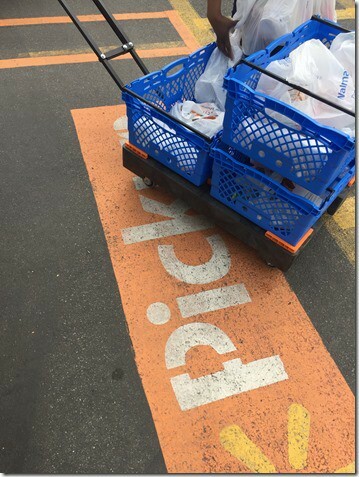 Before I put my car in gear, an associate was rolling out my groceries. We went over any substitutions, agreed on the final price, and I signed my order confirmation. She made sure I checked my eggs first and helped me load them in the back of my car. It was that easy! 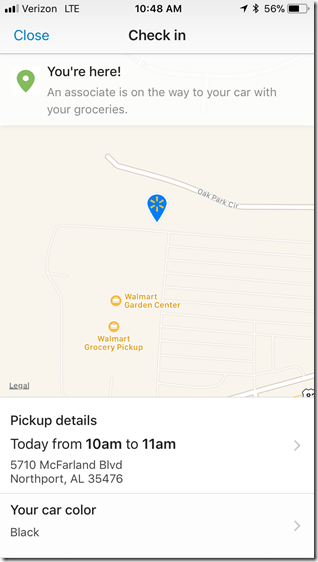 Here are some common questions I get about Walmart pickup. 1. What happens if they don’t have an item by the time the shopper works on my order? On your order page, there is a box next to each item to check (or a “check all” button) if you are good with substitutions. Because I buy some items that HAVE to be gluten-free, I uncheck those boxes. If those items are not in stock, it is removed from my order. So far, any subtitutions have been brand substitutions. I may have ordered Great Value tomatoes and I might get Del Monte. I have been VERY impressed with substitutions. 2. When do I actually pay? When I sign the device after discussing any substitutions, the total is final and withdrawn from my bank. Because meat and produce are often sold by weight, I don’t know my EXACT total when I order the day before. Most of the meat gives a price-per-pound and a “not to exceed” weight. If I need a roast for my family, I’m going to pick the one with a max weight of 3lbs. I don’t need the max weight that will feed a family of 10. 3. What if I want to change or add to my order? You need to do it quick. There is usually a 3-4 hour window to change an order, depending on when you set your pickup time. 4. How far in advance do I have to order? Again, it depends on your pickup time preference and the individual stores. I’ve noticed that my Supercenter has more available time slots during peak hours. However, my 2 times using the Supercenter convinced me to not use them again. I waited 45 minutes the first time. I waited 20 minutes the second time. These were non-peak hours and only 2 other people were waiting. 5. How much do I really save? On average, between $30-$60. One week, I spent about 60 bucks for groceries for a week. Most weeks, I’m getting under $100 a week. Even with buying my produce at Publix, I’m saving a good chunck of change by avoiding impulse buying. 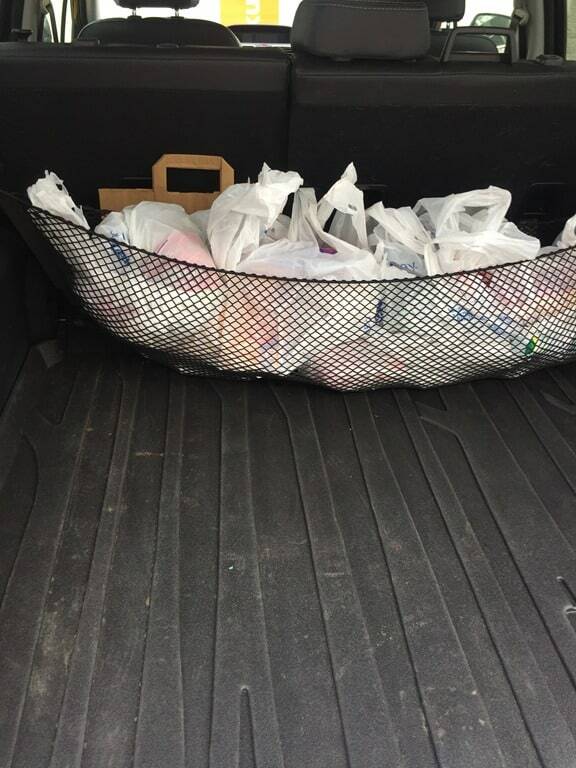 Walmart pickup at the Neighborhood Market has been a real game changer in our family. Buying only what I need for the next weeks is keeping some extra dollars in my account and less waste when I forgot why I needed a jar of artichoke hearts marinated in oil.